Do you envision that given LMS will evolve in their design through the integration of PLE solutions/tools and concepts? Hi Mohamed, so I guess PLE could include LMS. Sounds almost like real life, where you have (or should have) everything set up to fit your own individual learning needs, while at the same time also working with what is available through official channels, like school, social networks, clubs and associations etc. I don't see the two environments as dichotomized as you describe them. I have been infused with top-down input in a "LMS,"(an on-line Meteorology Course) then went on to pursue the subject by reading a book on my Kindle (The Cloudspotter's Guide) to enhance my knowledge and to view it through a more poetic lense. Did learning stop at the end of the course? Every time the wind blows and I envision it as air moving from an area of high pressure to low pressure, I experience a deepening of the knowledge. Did I wish that I could control the pace and content of the information more. Yes. But I don't know if I would have worked as hard without the structure. I think it depends on the nature of the content being learned which kind of environment works best. 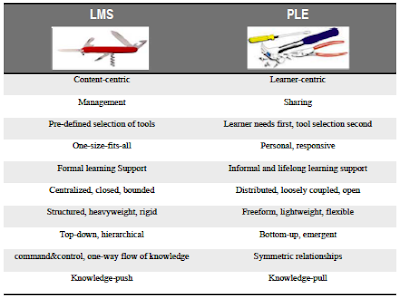 PLE versus LMS - Although I found the title of this blog a bit confusing - to me it seems to imply that one may be better than the other - I believe that the PLE and the LMS can not be mutually exclusive because we simply need both of them. If I think about most students' experiences, through the academic world, they have been exposed to LMS from a young age; the information was centralized, the expectations and goals were clearly defined, and for the most part knowledge was unidirectional with a beginning time and an end time. Basically they had to adapt to the system. On the other hand, with the proliferation of technology, PLEs - such as Google, Twitter, Facebook, My Space, YouTube, SlideShare, Google,...etc - are now very much accessible to users, and the beauty is that users do not have to comply to any system, they can select their own learning systems/topics/time and develop their own community, and network of knowledge sharing. In essence PLEs are flexible and completely "user-centric". In conclusion, I believe that ideally incorporating some level of PLE into the LMS would be very appealing and beneficial to today's end users. It seems that LMS is more like a traditional classroom which has a stable envrionment for studying, and knowledge is the context of textbooks. Teachers focus on the whole class rather than personal needs.In another words, teachers control the envrionment.However, once students apply blogs in studying, it seems they apply PLE in studying. I have a great appreciation for your differentiation between the LMS and PLEs. In my current course of study, my school utilizes Blackboard, which I find very limiting. As you said, once the course is over, I cannot continue to have access to the resources that were at hand. No more videos, links, or even documentation of my submissions and online presence. It seems that professors put a lot of time and effort into making all of this available to us, only for us to lose it all at the end of the semester. Had my school used an alternate method for our learning community, us students may have the opportunity to make use of these resources throughout our studies and later in our professional lives. Nice blog. The difference you have mention is totally except-able, But I would like to add some more line in your article. PLE and LMS both are important in daily life, one can not be exclusive and it will be not a good idea to give more preference to one than other. Both plays a major role. From LMS you will get aware about theory and rules and PLE will help to build your potential. learning management system is a traditional classroom which is having more stable environment, and in other word in school teacher has to control the environment, and to control first they have to create the environment.